Four thousand and three hundred Euros from the personal card of former Minister of Culture to goverment of Republic of Macedonia, Elizabeta Kanchevska Milevska were transferred to the account of the famous hotel chain Hilton in just one day. However, not from her private account, but from the account of the budget filled by the citizens of the Republic of Macedonia. Yet Hilton was not the only destination of the ex-minister, who was a frequent guest of the renowned Sheraton and Ritz hotels in the European and world metropolises. A sum of 300 Euros was paid per night in these hotels. The card was used for everything, from the purchase of a coffee machine-Nespresso, through shoppinh at Zara Home in Thessaloniki, the famous Greek shopping center “Notos Galleries”, then “Baldinini” in Venice, Moncler UK LTD in London. She also did some shopping at the Greek shop Public, known for technical goods, TZUM and Harley Davidson (recognizable motorcycle brand), where it was paid in rubles. She often paid more in shopping centers and stores than for staying in famous tourist resorts and metropolises. The card was mostly spent abroad, less often at home. And here most often in famous restaurants, but once also in the famous bookstore “Prosvetno delo”. Warnings and default interest also came with the costs due to untimely payment of installments to the “Diners Card”, which the minister carried on the trips, where she did not always go alone. One of the debts is a sum of over 500 Euros. With that card she withdrew cash but also paid in money. 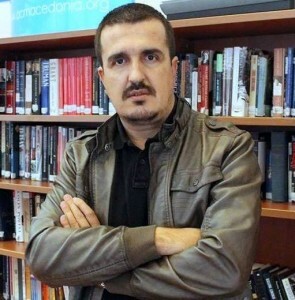 According to the documents obtained by the Center for Investigative Journalism SCOOP -Macedonia obtained under the Law on Free Access to Public Information, the Ministry of Culture had three official cards used by the three first people in the ministry – the minister, the deputy minister and the state secretary. Amounts paid by Deputy Minister Dragan Nedeljkovic are much smaller than those of the ex-minister. According to the statements from the card, he was an honorary guest of the regional hotels and cafes. He traveled to Belgrade, Zagreb, Skopje, Ohrid, Ohrid, Mrzenci… He was a frequent guest on the gas stations and on one occasion he used the card in a pharmacy. But his balance was also in debit. State Secretary Muzafer Bislimi was a frequent guest of the restaurant “Tivoli” in Tetovo, whereas his successor Behixhudin Shehabi used the card in famous Skopje restaurants and pastry shops. On several occasions he was a client in Bushi Fashion LTD, famous for the wide range of Swarovski jewelry. “There was no rule in the Ministry regarding representation expenses. There was squandering. It was not strictly regulated who was entitled to representation and to what extent. Our predecessors spent, but we have no report within the scope of what kind of projects, accommodation and the need to use that money in order to say whether their spending is appropriate. Money was spent inappropriately. The employees used the representations. Even catering was organized from outside to carry food in the offices”, said Minister of Culture Robert Alagjozovski in an exclusive interview with SCOOP. He pointed out that the costs at the expense of representation were made by state advisers and heads of departments. “500 Euros for a meal were paid at a restaurant. You must admit that even in Paris it is too much to spend 500 Euros for a delegation. How many people can you end up with lunch within a visit”, asks Minister Alagjozovski.